New York native Bob Baldwin has recorded on six of the seven inhabitable continents, and while Antarctica is not on his recording bucket list, his international list, including Dubai, Brazil, South Africa, Spain, UK, Canada, is quite impressive. "Whether it's a massive festival crowd of 30,000 or an intimate restaurant audience of 60, I refuse to rob my audience of great music and a good experience", says Baldwin. His 'theme' projects of Stevie Wonder, Thom Bell and Michael Jackson have all charted mightily on the Billboard Jazz charts, all hitting in the top 15. His very latest, Abbey Road and the Beatles has also crept into the top 20 on the charts as well. Previous releases of Never Can Say Goodbye and Never out of Season, were both remixed and remastered in the spirit of hi-def. Whereas older recordings would peak at the average 16-bit maximum, Bob is trying to push the envelope in re-tracking some of the music in 24-bit (and sometimes 32-bit mode). What's next? Well...funny you should ask. Bob Baldwin is re-writing and updating his book, “You Better Ask Somebody”, and will go in a little deeper on subjects like music streaming and the lowdown on Croton Jazz. See bio below, written by A. Scott Galloway. Across a career for which a two decade milestone was achieved in 2013 with his twentieth CD Twenty, Bob Baldwin has proven to be one of the most ubiquitous and ingenious chameleons of Contemporary Jazz - both in his own projects and those he has endeavored upon for others. Recently, he has twice honored the canons of giants: Never Can Say Goodbye: A Tribute to Michael Jackson (2010) and Betcha By Golly Wow / The Songs of Thom Bell (2012). For 2015, Baldwin turns to the sprawling catalog of Stevie Wonder to create one of his finest projects ever: MelloWonder: Songs in the Key of Stevie – an unprecedented one-from-the-heart that has taken him two years to lovingly assemble. In addition to his work as a musician, Bob Baldwin hosts a nationally syndicated weekly radio show ('The NewUrbanJazz Lounge' broadcast across the African American Public Radio Service and the Internet) and author of the music biz E-book “You Better Ask Somebody (Staying On Top of Your Career in the ‘Friggin’ Music Business)” (2011). Bob Baldwin [born Robert Garfield Baldwin, Jr. in Mt. 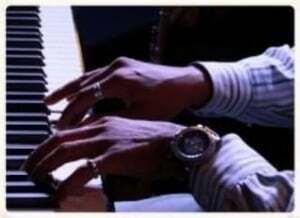 Vernon, New York] is a jazz artist, composer, keyboardist, producer, arranger, radio host and author. His father, Robert Garfield Baldwin Sr. who never recorded one solo LP under his leadership, played piano with bassists Keter Betts and Art Davis. Bob’s cousin is renowned pianist Larry Willis so he clearly stems from musical excellence. Bob began being taught piano by his father at age 4. His musical influences include Herbie Hancock, Patrice Rushen, Chick Corea, Earth Wind & Fire, Ramsey Lewis, Stevie Wonder and the late, greats Joe Sample, Miles Davis and George Duke. In 1986, he formed The Bob Baldwin/Al Orlo Project in New Rochelle, NY, performing at the legendary club the Bottom Line in New York City, opening up for Tom Browne of “Funkin’ for Jamaica” fame, and this led to his first production effort with trumpeter Tom Browne on one of the first-ever gospel-jazz offerings, No Longer I. 2000’s Bobbaldwin.com was his first independent release on City Sketches Records through the notorious Orpheus Records (Charles Huggins) featuring Gerald Albright, Marion Meadows and Armsted Christian (RIP). 2002’s dual releases Standing Tall, and The American Spirit on Narada and Shanachie Records were cathartic and ultimately triumphant artistic reactions to the tragic events surrounding the World Trade Center on 9/11 2001, where he performed there just two months prior. 2004’s Brazil Chill was inspired by six weeks spent in Rio de Janiero and Ipanema, and featured Ivan Conti and Alex Malheiros of the acclaimed trio Azymuth, Armando Marcal, Café Da Silva, Andriano Giffoni, Leo Gandelman, Toquarto Mariano, and pianist Marcos Ariel (who played chorinho flute). 2005 delivered an extra shot of his Brazil experience with All in a Day’s Work. Vibin' on a hobby, acquired from his late father. 2007 brought the release of his DVD “Live from Croton on the Hudson,” NY, an outdoor festival that drew over 6,000 people overlooking the beautiful Hudson River. 2008’s NewUrbanJazz.com fused Jazz and Funk with vocals, and featured Jocelyn Brown, Frank McComb, Phil Perry and Freddie Jackson. A 2011 follow-up 2011’s NewUrbanJazz.com 2 / Re-Vibe featured Glenn Jones and Porter Carroll, Jr.2009’s Lookin' Back reflected on his career back to his first recordings going back to 1988. Baldwin also released the gospel-jazz missive Never Out of Season and the holiday offering The Gift of Christmas. Beyond his sprawling catalog of recordings, Bob Baldwin has used music to support social causes and to give back to the community. His internet-only release City Sketches - a disc privately released commemorating the 1996 Olympics - is a musical portrait of the city of Atlanta celebrating the city’s unique history. Violinist Regina Carter so loved "Downtown Underground" that she in turn recorded it on her CD, Something for Grace. Baldwin performed for the athletes at Atlanta's Olympic Games and shared the stage with Roy Ayers and Chuck Loeb at the Club Benson and Hedges Music Festival. Then in 2000, he travelled to South Africa with Marion Meadows for a historical concert. Baldwin was the Curator of the NewUrbanJazz @ the Arts Exchange in White Plains, NY. Collaborating with ArtsWestchester and the White Plains Youth Bureau, Baldwin presented a workshop that would prepare young people for a career in music. In 2010, his Jazz for Haiti program raised over $60,000.00 for the American Red Cross of Northern New Jersey. And in 2013 he produced the benefit concert "Music for Dave" to assist Latin Jazz legend and stroke victim, flautist Dave Valentin, with funding for his ongoing treatment and rehabilitation. He reached out to Larry Rosen, the original GRP Records owner (RIP), who signed Valentin to his first deal, who contributed to the event. Wedding his many talents to a fierce streak of conscious independence, Bob Baldwin sees himself as more than just an artist but a human being in control of his destiny and with a legacy of artistic benevolence to pass on.